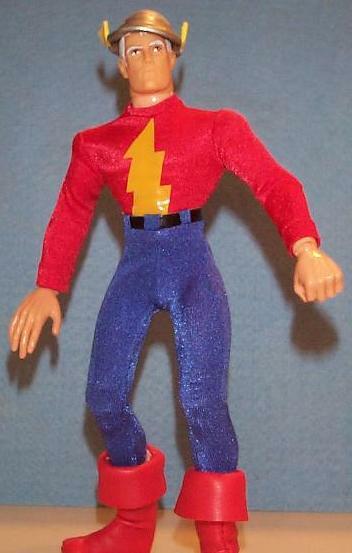 Here is the original Flash, Jay Garrick. He is a popular custom after the Barry Allen and Walley West versions of the Flash, so I thought I would take a stab at him. He is shown here as he appeared in the Terminal Velocity story arc. He uses a Famous Cover type 1 male body, with a Peter Parker head. The pants and boots came from Captain America. I made the shirt, with a crew neck collar. The lightning bolt is made of PVC tape. One thing I did was to trim off all the excess material on the inside of Captain America's boots. I also then put a couple of stitches in the back of the boot to hold the boot cuff next to the boot. The end result makes the boot cuffs look more full and even. I'll should make the same improvements to my Captain America FC. I stole Skip's idea of turning Thor's helmet inside-out for his hat. I used craft foam for the wings. I got a nice silver, by painting it silver with enamel paint, and then putting a coat of acrylic paint over that.